Rectangular Aluminum Connectors | CMC Rectangular Connectors | Cal Fasteners, Inc.
CMC’s type CA and type LI rectangular connectors are manufactured out of high strength 6061-T6 aluminum alloy. This special material provides exceptional strength and maximum electrical conductivity. These aluminum connectors are electro tin plated for low contact resistance and corrosion prevention. They are dual rated for use with both copper and aluminum conductors. Assembly is fast and easy, requiring only a screwdriver or allen wrench (depending on model). Connectors are reusable. UL and CSA rated and RoHS compliant. All CMC connectors are manufactured in North America. 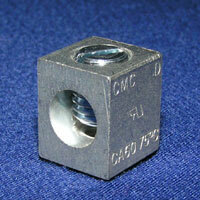 Request a quote on rectangular conductors from CMC, or contact Cal Fasteners to learn more.